So you want to be a missionary? Specifically a Chi Alpha missionary. That word "missionary" comes with a lot of baggage. For example, my iMac dictionary defines missionary as a person sent on a religious mission, especially to promote Christianity in a foreign country. Merriam-Webster defines it as a person sent to a foreign country to do religious work such as convincing people to join a religion. I have to be honest. Those definitions do not really excite me. Do they excite you? I mean do you want to be defined by being on a "religious mission", to promote "Christianity", and one who is convincing people to join our "religion"? I know I don't. However, it does bring to light a good question. What does it mean to be a Chi Alpha missionary? You see how you define the term missionary will ultimately define what is that you will be doing as you approach a campus as a missionary. So it is important that we define our terms. As Chi Alpha missionaries I think it is fair to say that we want to abandon the idea of promoting religion and being religious all together. However, to do that it means that we have to be something other than religious in who we are and what we do. This is why I love the term Chi Alpha. because it is derived out of 2 Corinthians 5:20 because we believe each Christian is an ambassador of Christ. This isn't some cool college ministry slogan, it is who we are to be. Therefore, we are not about replicating religious models or defaulting to religious programming simply because that is all we have seen institutionally, or participated in programmatically. Being a missionary in Chi Alpha means we need to understand what it means to live missionally. The above scripture has a twofold idea within it that we need to understand a Christ's ambassadors. These ideas will be more thoroughly discussed as we continue our training, however, for know we just need ta brief understanding so we can comprehend that God is operating in all things, through all things, for his purposes and glory. The first idea we need to understand is that God is a sending God. Jesus was sent as the fulfillment of all that God had promised throughout history. He was the mission of God in the flesh, walking it out incarnationally, among the people, exemplifying God's intention in man for man, as the Father intended. Through this knowledge we can comprehend something specific about who God is. Just as we know through scripture that God has certain characteristics such as holiness, sovereignty, wisdom, justice, love and so on. We also know in Christ that God is a missionary God or a sending God. The second idea we need to understand is that we, as the people of God, are sent by our sending God. Because God has a sending nature, we as possessors of his Spirit must also allow that part of who He is to become who we are. Therefore, rather then seeing ourselves primarily as paid professionals with a certain biblical skill-set. We must understand that "sentness" is an attribute of who we are in Christ. Because we carry his Spirit, we cannot separate the mission of Christ from the person in whom we place our faith. As we know Jesus and walk with him we will be as he was. Therefore, as Christ is Lord of our lives, and we are being transformed into his likeness, we become missional in our mindset, approach, functions, and actions. This key not only in our understanding in our own walk as Chi Alpha missionaries, but in fulfilling the purposes for which we are called. We are not just missionaries on a religions mission convincing people our religion is better than others. We are the missional people of God who have sentness in the very being of who we are in Jesus. Being missional is not something we do, it is who we are. Just as the fruit of the spirit are signs of God's transformational power of God working in us, so is being missional. 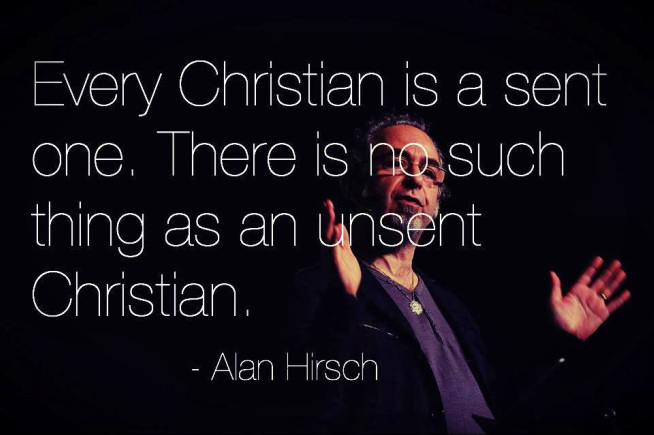 As the picture above states, "Every Christian is a sent one, there is no such thing as an unsent Christian." Therefore, in Chi Alpha we do take serious the idea of literally being Chris's ambassadors. We do not define the term "missionary "as something we do, but we define as something that comes out of who we are in Christ. As I said earlier we will delve into these concepts in depth later on as we proceed in our training. However, this foundation is key in our understanding of what we will do as we entire our context, our mission field, as sent ones in Christ. If we are products of Christ we have a promise to do greater things then even he did as we enter our campuses. However, if we are products of something other than Christ, then we will replicate something other then what he is asking of us, something other then him. Sadly, this happens way to much and has now caught up to the modern church. So the questions you will challenged by in this introductory section are, "As Christ ambassador what is that you will represent? ", "As Christ ambassador what you make? ", "As Christ ambassador what will you reproduce? , and "as Christ ambassador will You do it God's way?" In a world were business models, branding, leadership, casting vision, and organizational skills seem to be what matters in ministry, have you personally stopped to consider if those things as who God needs us to be? Have you stopped and thought about if those things are even working? The introduction will look into deeply into each of these questions. It most likely challenge everything you know about Christianity and experienced in ministry. It is purposed to make you aware of the current cultural problems we face and to see the delima the church now finds itself in. In order to function as we are purposed in Christ, to truly be his ambassadors, we will have to break down some thoughts and understanding we bring to HIS mission. Through prayer and awareness our hope is that you will be missional in your approach in serving your campus and not institutional. Our goal is not to do his mission our way, but to do his mission as he intended. With that in mind we will look closely at our current condition, the problems we are having, our focus, and what we should do.